Maybe it’s because I’m one step away from graduation that our professors are making sure that each and every student never forget all the lessons when we leave. Especially now that I’ve got two months left. I’m not so sure if I’ll even be able to nap or check my social media accounts by then. Anyway, I’ve finally had the time to write a new post for my blog! As the title says, this is my unboxing sesh of the newest addition to Althea exclusives! Yes, I am one of the lucky Altheans who were able to get their hands on these pretty babies. Actually, this has arrived on the last week of March, but as I’ve said: I barely even had the time to stop and smell the flowers. My schedule is so hectic, and my stress level is at its peak — which is visible on my skin right now! Pimples are reproducing themselves! Aaack! Believe it or not, I was able to open it yesterday only which was April 12th. So this box has been sitting on my table for some time now. So, let’s head on to the unboxing of the newborn crowd-favorite! Before Althea launched Bare Essentials collection, I was already a fan of their Petal Velvet Powder. This magical powder can actually control my sebum and makes my skin less oily than ever. Not to mention that it glides smoothly on my skin. It is not also hard to dispense because the holes in it are just in the right size. 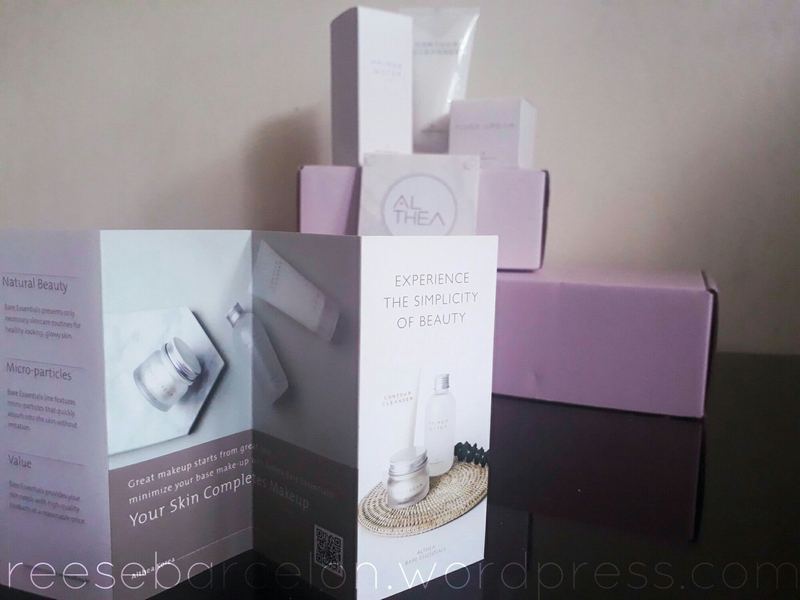 When I’ve heard that Althea will be releasing a new set of products, I already had a high expectation knowing that Althea always wants the best for their customers. To be honest, I love Althea so much that if they’d sell a bottle of tap water, I’d buy five bottles straight! What is Althea’s goal for introducing their own set of products in the market? I can tell that Althea knows just what their customers need. According to them, they knew that their market is intrigued with the 7-steps korean beauty routine and also unsure how or where to start — which is absolutely true. Not to mention that it is also heavy on the wallet to get seven different products. For me, I wanted to give my skin all the nutrients it can get from the whole seven steps just to achieve a white and flawless skin but I’m quite afraid that my skin won’t like it if I put too much in it. I’m just scared that using seven products altogether might not do me any good, considering that my choices are poor when it comes to skincare items. Korea has thousands of products out there and it is overwhelming! So Althea’s effort in guiding us into a more simple process means a lot not only to me but to those with skin issues. Trimming down a whole seven steps into three is more appealing and less time-consuming! Althea removed what they thought is just an addition and focused on the most important parts of the whole process — cleansing, toning and moisturizing. As of the moment, I’m using a couple of products on my face so I won’t be able to try these goodies yet, so I gave the sample sizes to a good friend in exchange for her quick reviews about the items. So, let’s see what my friend has to say! 1. Contour Cleanser (Php 300.00) This cleanser has soothing properties and detoxifying extracts to gently cleanse, exfoliate, and detoxify skin. It also helps to promote blood circulation, and can give you a slimmer face. A special water which functions both as a toner and primer in one. With continued use, you can achieve a smooth and silky texture that enhances the skin’s natural glow. Fixer cream prevents moisture loss, promotes collagen regeneration through natural ingredients. Can you guess which one my friend loved the most? It’s the Contour Cleanser! Woohoo! According to her, next morning, her face was very bright and soft like baby’s skin! Since I’m almost finished with the products I’ve been using, I think I’ll be able to use these in two weeks’ time. Can’t wait! 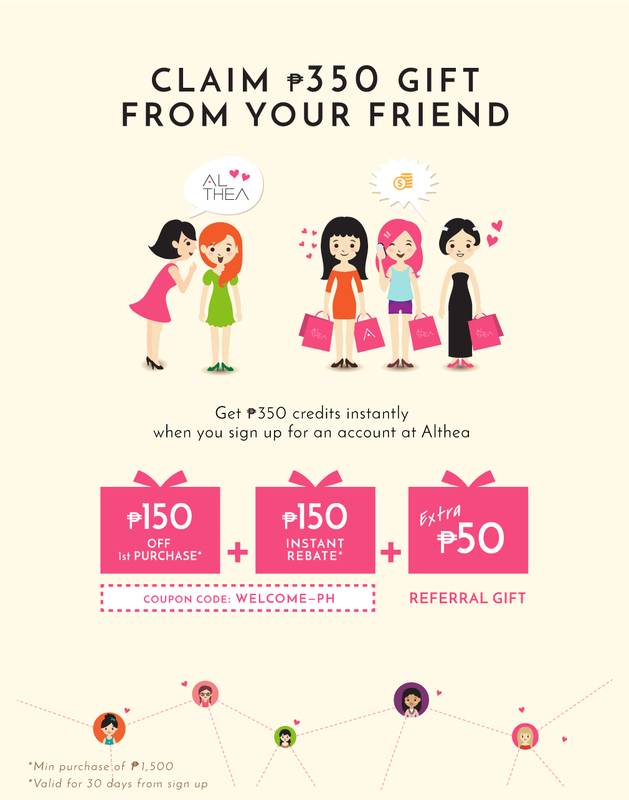 Now, head on to Althea‘s site or download their app, and get yourself these products before you lose your chance! Remember that there are a lot of Altheans whose fingers are really skilled. LOL! Also, you may use my special link for you to get an additional discount when you purchase your first-ever order! Has anyone of you tried these babes already? What do you think? Let me know what’s on your mind! hahaha your friend! she’s hilarious!